Review: Ever wonder what your life would be like if you could go back in time and change just one little thing? Maybe something that was life changing, didn't work out the way you wanted, broke you heart, or even something you may regret? This isn't the first time I've thought about these questions and Hourglass makes a person think about the pros and cons for being able to change the past. To say I loved this book would be an understatement. It's actually very hard to write this review without spoilers, so I'm going to try my hardest. Myra McEntire's story has various elements that come together in different dimensions- hmm..where to start? The overall psychological aspect of this book had me from the beginning- trying to understand a character who doesn't even understand herself. The reader grows alongside Emerson as she discovers who she really is, and what she can do with the "gift" she has. A reader can emotionally connect with the main character Emerson. She lost her parents and in the midst of all that she also looses herself. Emerson begins to discover she has a gift, in which she often mistakes as being "crazy" because she doesn't understand how seeing people and objects from the past can be helpful. The connection that Em has with her brother is strong and heartfelt. If I had an older brother I'd want him to be just like Thomas. Always wanting the best for his younger sister, he hires Michael. Michael, who works at Hourglass comes into play very early on in the book. That is something that I enjoyed greatly- events are always taking place when you least expect them. Michael is one of those people who seem mysterious. You know there is more to his character that hasn't been revealed yet, so we patiently wait. haha. Emerson may think that she is alone in her crazy world, but Michael is more like her than she thinks and together they have to undergo a mission that could potentially hurt or even kill them both. They don't know what they are up against and the people that they least expect are against them! Sound dramatic? it is! And that is one small element to this amazing story that pulled me in even deeper And the twists and turns towards the end of the plot are written so well- I didn't see it coming. 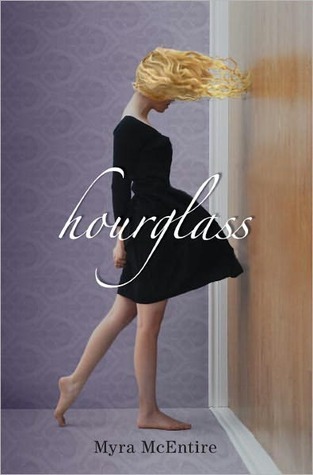 Hourglass is a creative read that will take you back in time, to look at life and question whether or not life would be better if one little detail from the past is changed. I have yet to read this book! I really just get to it soon! Nice review!